Recently, the Education Council released its first report based on data collected for the Nationally Consistent Collection of Data: School Students with Disability. The report describes 18% of school students as having disability. This rate of disability among school students in the major states (see Table 3 in the report) aligns remarkably closely with the average disability rate (18%) in the Australian population. But this level of disability is far more students than other reports of children with disability. A newspaper article says "the survey 'fails a basic credibility test' according to federal Education Minister Simon Birmingham". The Minister's concern is with the disparity in figures between the different states. My concern is that while the Australian Bureau of Statistics (ABS) reports that the average rate of disability in the Australian population is 18%, the same average level that the Education Council's report says it found in schools, other data show that the disability rate across Australia's population varies substantially with age. The ABS report shows the disability rate for school-age boys is about 10% ... and lower for girls. Schools are finding far more students with disability than appear in another key dataset. It is not clear that consistent definitions of "disability" are being used. 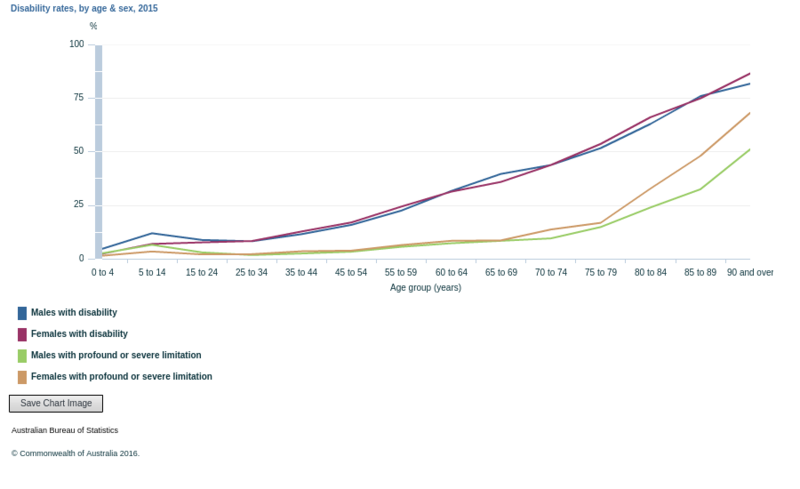 The disability rate of 18% in the Australian population is not reached until age 45 years ... and it rises steeply from then on. The disability rate is substantially lower among children (around/below 10%). Given the cuts to ABS funding in recent years, it is not surprising that the ABS has not reported on the disability data that it collects as part of the nation Census. It is incredible (literally) that state education Departments report 18% of school students have disability when under 10% of children of the same age have disability.